With all the snow we have been getting, it is important to keep snow cleared around utilities in the event they would need to be accessed in an emergency situation. It is also important to use care when clearing snow around them to prevent damage to the infrastructure throughout our community. “We want the community to safely clear snow from these areas so they are easy for utility staff or emergency personnel to access if needed,” says Amanda Gloyd, SMU marketing and community relations manager. In Spencer, there are over 600 fire hydrants and most of them are marked with a flag to help locate them if they are buried in the snow. Clearing three feet all around fire hydrants is recommended so they can be easily found and accessed if needed in the event of an emergency. Another thing to keep clear are the electric transformers. There are over 1,600 ground-level pad-mounted transformers and cabinets throughout Spencer, and these take the place of utility poles, overhead power lines and overhead electric service lines to homes and businesses. These transformers enclose energized electrical conductors and distribute voltages from 50V to 15,000V and are highly hazardous when damaged. The National Electric Code states to allow at least 10 feet in front of them and 3 feet on the sides and back for staff to be able to access the cabinet if needed. In addition, SMU would like to see a path cleared to each transformer to help restore power quickly if a power outage would occur. With the conversion to Fiber-to-the-Home (FTTH) communication services throughout Spencer, the number of communication pedestals throughout Spencer is decreasing, however, for those still installed and operating, we suggest clearing the snow around them in the event we would need to access them. 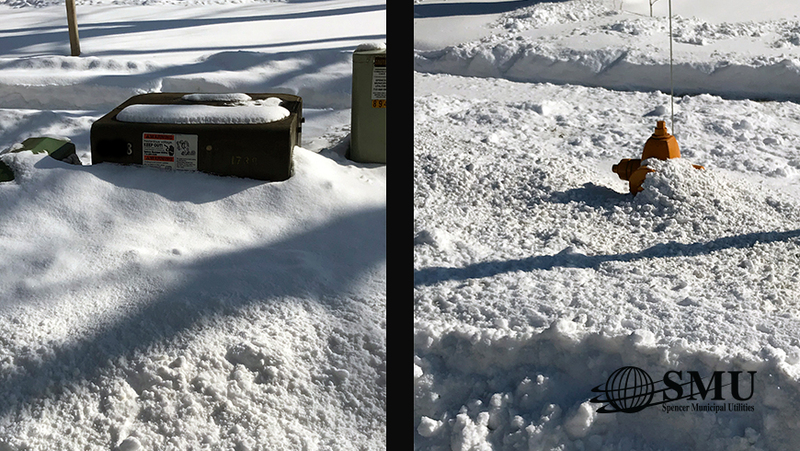 In the areas of Spencer with FTTH, there are vaults with communication equipment buried in the ground and we suggest being careful clearing snow around them and preventing heavy snow removing equipment from causing damage. “When clearing snow around utility equipment, we recommend using a shovel to prevent damage and to be aware of the utility infrastructure below when clearing snow,” adds Gloyd. If you have noticed some damaged equipment, please contact Spencer Municipal Utilities at 580-5800 so it can be inspected, and to determine if there is a charge for damage incurred.